Coffee-Mate Non-Dairy Hazelnut Creamer. No refrigeration needed. Gives coffee a personal touch and personalized taste. Packaging and Product are superb. They come in neat little boxes that can also serve as a storage container. This helps keep your coffee area organized. They DO NOT require refrigeration. 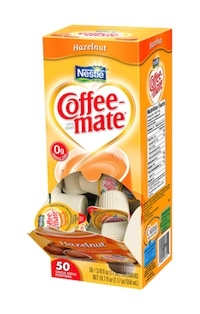 Coffee Mate Hazelnut is probably the fastest growing of our CoffeeMate Creamer line. Once our clients try it, they always order more! !